"This was no ordinary bronze medal. This was a skinny white kid ... showing he can mix it with the Africans." - Marc Hinton writing about former Michigan Wolverine Nick Willis' stunning Olympic bronze medal in the men's 1,500 at the 2008 Olympics. 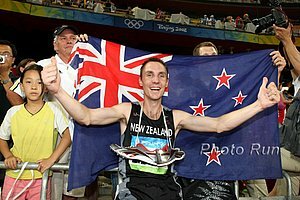 The Kiwi won New Zealand's 1st track medal in 32 years. Way to go Nick!!!!! The top two in the world proved it in the 1,500m while Nick Willis put together the best possible race to come away with the bronze. The 400m semis had no major casualties, as Wariner and Merritt made their expected statements and other main medal contenders got through.